— Miriam Elder, world editor, BuzzFeed News. “Area reporter unable to pre-write anything due to complete uncertainty about what comes next.” — Byron Tau, WSJ. “As Sarah Huckabee Sanders ends White House press briefing after only a few minutes, reporter is heard yelling, ‘Do your job, Sarah!’ — CBS News. The White House held a 10-minute press conference Tuesday. 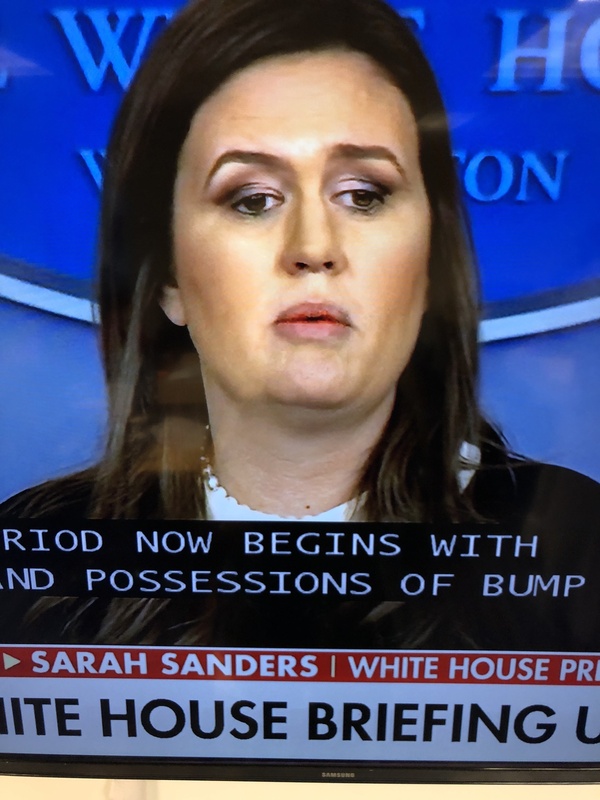 Sanders employed her quintessential smokey eye, but someone forgot one thing: BLENDING. According to makeup.com, the top tip is “blend, blend and blend some more.” Also: less is more. Don’t kill the messenger, you know it’s true. Christmas is almost here. Something called a “contouring brush” could make a great stocking stuffer. This one looks amazing. 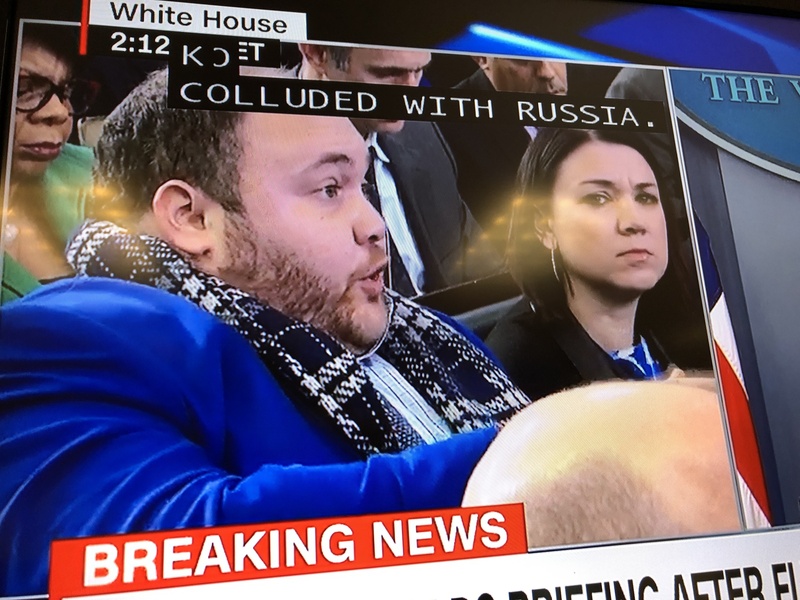 Also, a special shoutout… to WaPo‘s Josh Dawsey for showing off my favorite journo-attire of the week. Seriously, no advice. Keep this look coming. Huffpost’s Jessica Schulberg writes about a a guy named ‘Monster’ whose site, Gab, is allegedly a “gathering place” for neo-Nazi types. My favorite line: “That was the year that Monster found Jesus.” Read the whole story here. Oh, there’s more: “I called her back to tell her my side of the story. I answered her questions off the word. [Is he trying to say off the record???] And I closed by reminding her that a God in heaven will judge her for her work should it be less than truthful. For the rest, she quoted me from my written commentary.” Phew! “I have confirmed with an editor that all my nightmares are true. Editors definitely notice when you are tweeting and not writing.” — Lyz Lenz, writer, Columbia Journalism Review. “Another update: after waiting outside the dnc all day to hear how the meeting went, all parties left through the garage to avoid me. Security guard just told me b/c ‘I feel sorry for you. '” — Alex Thompson, Politico. “Tonight at the train station a lady rubbed my head, fascinated by my yarmulke. This place is Extremely Not New York.” — Seth Mandel, executive editor, Washington Examiner Mag. He has blocked me on Twitter, which is only going to make me scour his feed more. So thank you, a big shout-out to Seth for that. “One of my ex boyfriends got me a Christmas present so I feel like the rest of my exes should too. idk I don’t make the rules (I do make the rules & they clearly state I need more presents).” — Sydney Elaine Leathers, ex-sexting partner to former Rep. Anthony Weiner (D-N.Y.), who is in prison for sexting with a minor. “For the record, this is the second @politico article about me in a short period of time with *0* named sources to back claims containing false information. Their articles are printed + distributed to **Congressional offices** – w/ no named sources. It’s really unfortunate.” — Rep.-elect Alexandria Ocasio-Cortez (D-N.Y.). “Bunny Melania, I just love you! And little D is doing great too #bunnies BUNNYLAGO COMING SOON!! !” — Mika Scarborough on Instagram. NYP‘s Page Six: Former Speaker John Boehner is writing a book about himself??!! Maybe we’ll finally find out how he really stays so tan all year round. Here. Splinter News: Writer Libby Watson seems to think there are interns who have shaved lawmakers’ legs. Hmmm….I’ll believe that maybe when I read it. She’s asking for Capitol Hill interns to spill their horror stories. The headline definitely inflates the content, which is zilch: “Ever had to trim a senator’s nose hair or shave their legs?” So far, the writer doesn’t have the goods. Here.